One of the most daunting decisions faced in an aircraft project is the choice of engine. This is certainly the case with the Fokker D7 due to the limited field history of this kit. At the time of this writing the only powerplants in use on Airdrome Aeroplanes D7's is the large-bore VW, a Hirth two-stroke, and a Suzuki adaptation. The 2280 VW delivers good power but max power can only be maintained for a limited time due to cooling problems. 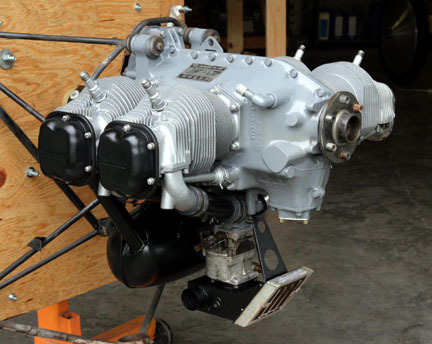 The Hirth is a two-cycle engine and I have personal reasons for not pursuing that option. The Suzuki alternative is still a bit too unproven for my taste. 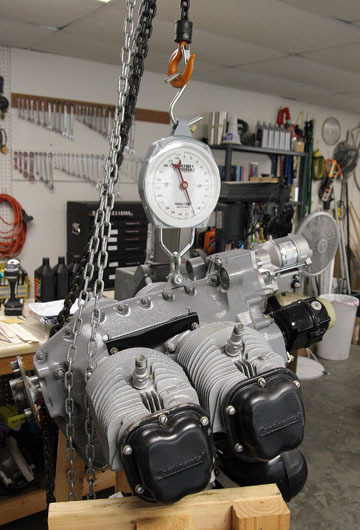 I want an engine that will require a minimum of fuss during operation and has proven reliability. A complicating factor with the D7 is the shape of the cowl. 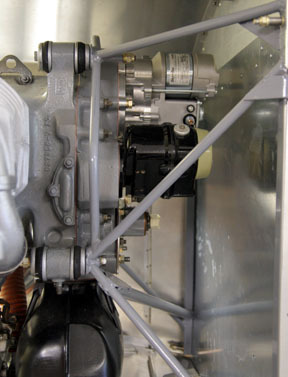 The original D7's had an inline six-cylinder which needed a long, narrow enclosure. The VW heads protrude slightly from the D7 cowl but not an excessive amount. The Suzuki can be completely enclosed as can the Hirth. So the decision has to be based on whether aesthetics will be the highest priority or authenticity can be compromised for the sake of powerplant selection. I decided to place highest priority on an engine in which I had maximum confidence that reliable service would be delivered. This took me in the direction of a conventional "aircraft" engine. There isn't a more conventional choice than a small Continental. 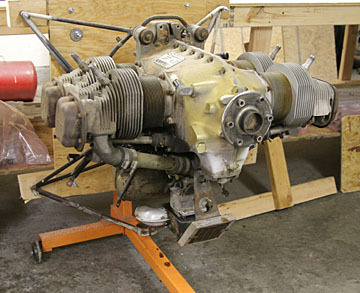 These engines have powered many small aircraft for seventy-five years and most pilots have flown behind one during primary training. I decided to investigate the possibility of using a small Continental in the D7. A conversation with Robert Baslee, designer of the AA D7, explored how the Conti weight compared with the big VW. We determined that a non-electric O-200 would have similar flying weight to a VW that had a full complement of electrics and ignitions. Robert also assured me the D7 structure could be easily adapted to the Continental. Yes, the O-200 cylinders will protrude from the D7's cowl slightly more than the VW heads. We will need to address this issue once the cowl takes shape. Prior to mounting the engine on the D7 for the final time I got out the uncalibrated game scales for some real-world numbers. 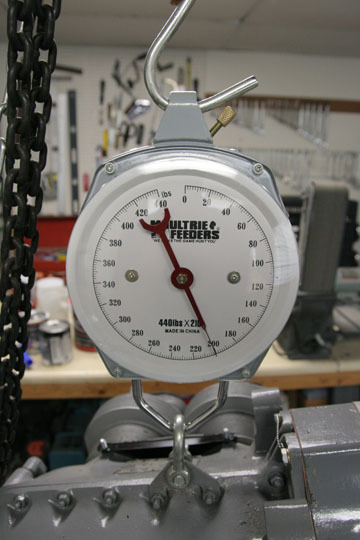 The scales indicated exactly 200 lbs with no oil or exhaust. This does however include a lightweight starter but no alternator. 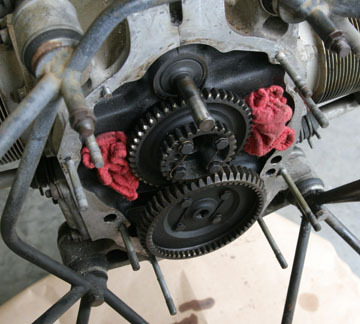 The Aeronca exhaust stacks weigh less than 3 lbs and four quarts of oil about 8 lbs. This is quite close to what a full-up big-bore VW weighs and the O-200 will put out a true ~100hp all day with no worries about overheating or loss of reliability. These engines are available used for prices comparable to new VW packages. I think they make a great option for many of the larger AA aircraft. New Continentals are hideously expensive. A used engine was the only option I seriously considered so attention was directed to Barnstormers for available used engines. 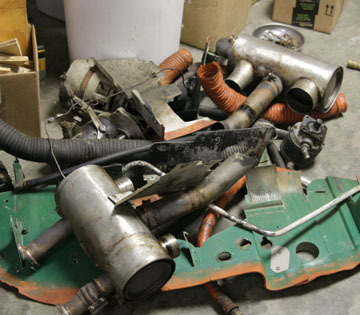 It became apparent that a used O-200 or one of its cousins could be purchased for about the same $$$$'s as a new VW with redrive. The hurdle that must be jumped is finding the right one, an engine with a good chance of having serviceable parts and history. Here is what I hauled to the shop. An O-200 that began life in a 1968 C-150. The logs only go back twenty-five years but the engine has flown and been annualled in recent years. Matter of fact it ran just prior to purchase with good oil pressure and compressions. The engine is obviously in need of some TLC but I think it will be the basis for a solid powerplant. As a bonus, it came with a pair of low-time Slick mags and harnesses. But it is waaay too heavy in its present state with a lot of C150 stuff not needed on the D7. So it was time to put the little engine on a diet. ......and here is what was removed. 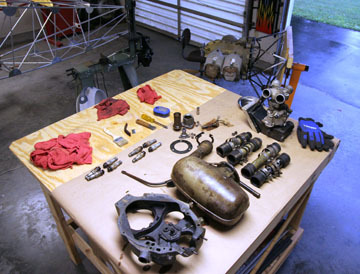 This pile includes the 15+ lb starter, the 10+lb alternator and the C150 exhaust, vacuum pump and baffles. Obviously the Fokker will need baffles and exhaust but a lot of weight was shed. 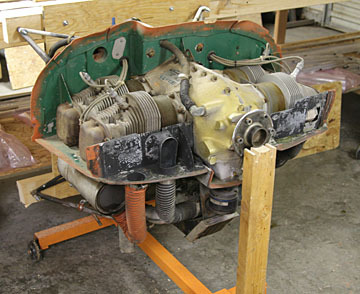 According to the Continental O-200 manual, the stripped down version should be less than 200lbs. The internals of the accessory case look clean and well-oiled, and a cursory examination of the cylinders show them to be corrosion-free. The engine mount will be modified to fit the D7. 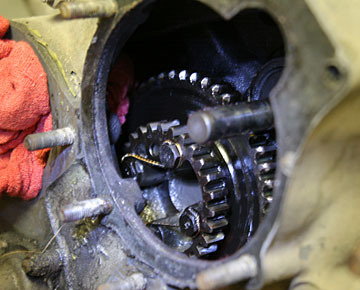 Also visible in this photo is the pinion shaft for the old pull-style starter that was on the engine when received..
All the accessories have been pulled off the engine in preparation for cleaning, painting, and assembly with new gaskets and fittings. I have not found any corrosion so hope we have a healthy engine. 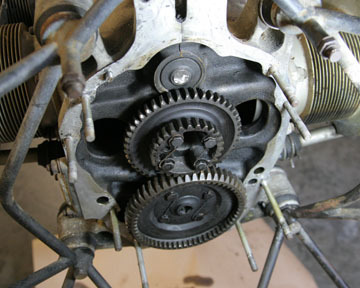 Time to amputate the old starter pinion to make way for a new, lightweight Sky-Tec starter. There is a STC for this procedure and it is usually done with the engine in the plane. But this will be much easier with better access. The engine was carefully masked to assure no filings get in the engine. The shaft was removed with three successively shorter cuts with a Dremel and fiber cut-off wheel. Old starter pinion excised and ready for the new starter. After some paint, new gaskets, and reassembly, the O-200 is ready for the D.VII. 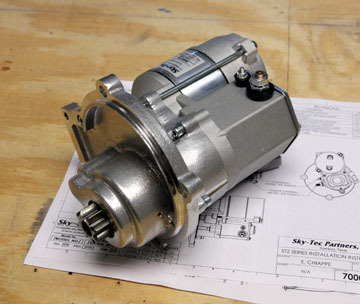 A lightweight starter and exhaust system is on the way and fabrication of an engine mount will begin soon. The Sky-Tec lightweight starter is my concession to freedom from hand propping the O-200. It should easily hand-prop with two impulsed-coupled Slick mags, but the lower wing results in a long walk from the prop to the engine controls not to mention the need to chock the plane. There will be a small, 17AHr battery for starter power that will be periodically charged in the hangar and should be good for several starts. The engine can still be hand-propped if the battery runs out of juice unexpectedly. 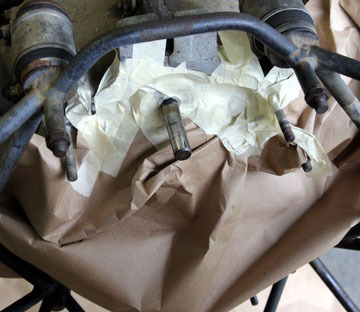 There is just enough room between the firewall and engine to install/remove the starter with the engine in place.